While I say I’m a “recovering Foodie”, I frequently find myself relapsing into old habits…like stalking new restaurants. In the months before Industriel opened I thought it was going to be a Gallery, but when I found out it was a restaurant I excitedly counted down until the opening-then completely forgot about the place and fell into a really boring dining rut (recovering = salads every day). I recently peeped the menu and brought my Downtown partner in crime (and fellow Bottega Louie enthusiast) here for a working lunch. I was immediately struck by the rustic decor which combines a French apothecary and avant-garde boutique like the Astier de Villate (by the way, the website for the Astier de Villate is so interesting!). Truth be told I kind of felt like I was in a Nine Inch Nails Video. 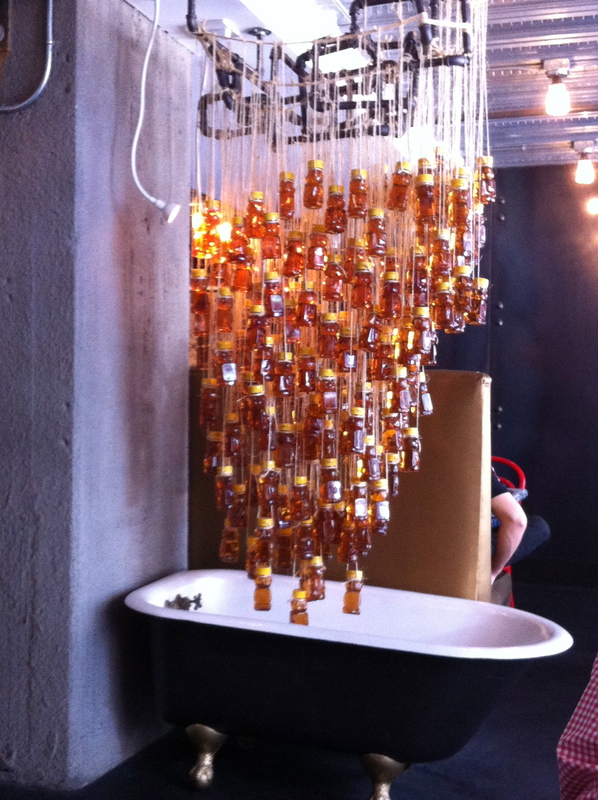 The big showpiece in the restaurant is the honey bear chandelier designed by owner Armen Hakobayan. It hovers over a mini vintage clawfoot bathtub. I really liked it. Not sure what’s up with L.A.’s fascination with hanging bears though. I still see them in Echo Park, but I digress…. Industriel definitely gets cool points for finding a unique way to masque exposed ceiling pipes! Industriel’s cuisine features a French Farm to Table theme. I went the healthy route and had the Beet Quinoa salad with Feta and arugula. It was so clean, fresh and healthy I LOVED it, especially since it wasn’t food coma inducing (though next time I’m having it with a burger; they looked sublime). My partner in culinary crime had a Kale Salad featuring house cured bacon, white anchovies and parmesan. I’ve previously heard that this salad was salty, but my friend thought the flavors were bold and complimented each other. He even went as far as to proclaim it his favorite salad of year-quite a compliment. 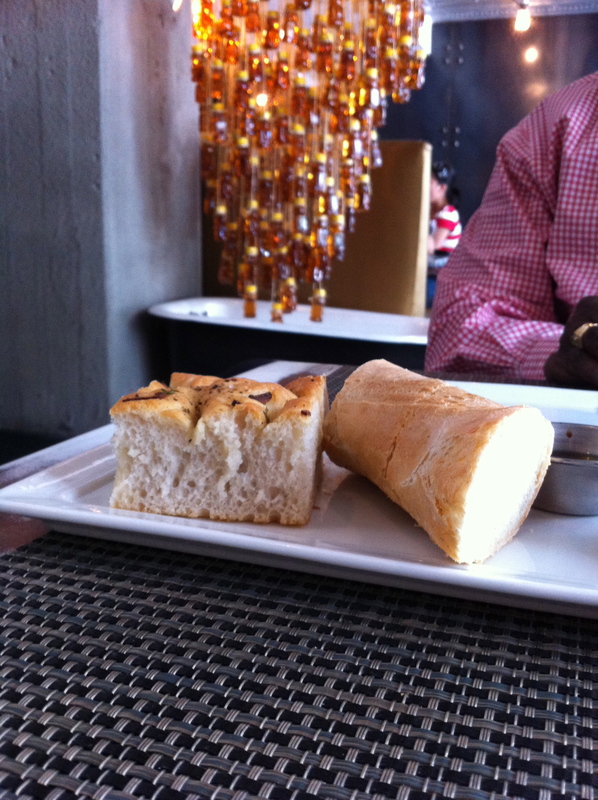 My only compliant was a minor one: I didn’t like the whole “charge for bread thing”. Despite that, the service was impeccable. This is one of those Downtown spots that doesn’t feel corporate. I loved that aspect of Industriel. I’m looking forward to a return visit especially when I want to feel like I’m in a cool cafe in Provence. Sounds fun, delicious and healthy! Could the bears be??? A SHOWER? Goes well with the claw foot tub.